At the moment there are is no confirmation that Grim Fandango 2 is in process. However, in the past (up to as recently as July 2006) there have been many stories and rumours of the possobility of a Grim Fandango 2 being in production, but most are likely to be false. The following is a timeline of Grim Fandango 2 stories and rumours. However, this turned out to just be speculation. Though it is now very unlikely that this will happen. LucasArts began to produce a Full Throttle 2 and Sam & Max 2, while this was happening there was some hope, nut unfortunately both these games were cancelled. 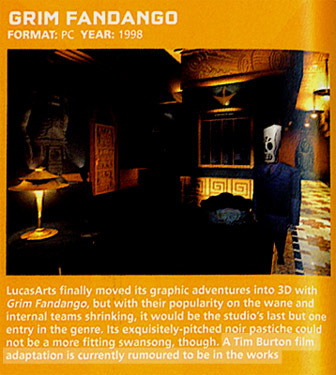 This makes is very unlikely that they will start on a Grim Fandango 2. Although unlikely, there is a still a chance this may be true, as it takes a long time for games to get through the planning phase. We'll just have to wait and see. In July 2006 a member called Nick_Virago made this thread on the LucasForums. He pointed to a site called The Movie Centre which included this quote from an interview with Tim Burton claiming that he would be working on a Grim Fandango movie as one of his next projects. It was backed up with a few other websites and even mentioned on Gamespot's rumor control causing quite a few members to believe the story. Some members became suspicious after the user was able to 'find' websites which takled about the Grim Fandango Movie before they had even been indexed into Google's search engine. After some research it was found out that this was very likely to be an elaborate hoax with all of the source websites coming from one person. More information on this is available here. If any real news does develop about Grim Fandango 2 or a Grim Fandango movie, we'll be sure to post it in the site news straight away.